How do we describe falling in love? Is it brown eyes that bat serenely? Is it a fleet-footed gate? The subtle bounce of a rear-end turning a corner? What words describe the feelings of amour when we watch him eat grass? Ah, there is nothing like bunny-love. We complied with the rabbit’s request, taped him into a cardboard box and brought him home along with $200 worth of rabbit gear. Now, he’s cost at much as some of our music gear. Hello World. Meet Jackson. Any words, Jackson? Ah, a lively personality to add to Short Punks. Stay tuned for more on Jackson. I’m looking forward to the next installment: Cat Jealousy. How’s the interspecies détente working out? Cute bunny! But will it make the cute Olympics? 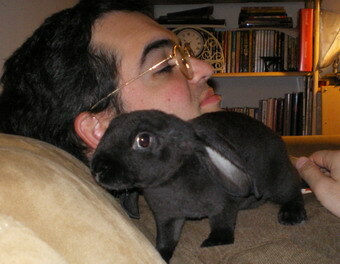 Oh man Jackson is adorable…but I haven’t a clue about rabbits; are they trainable? Do they use catboxes? Cats DO use litterboxes. She has a litterbox in her cage and she’s learning to use it. I thought it meant — and tell me if this is too much information — that they would poo and pee in their boxes. What it really means is that they know to urinate in the litterbox in the cage and not outside on the Louis XIV furniture. Somehow, in my picture of it, I thought they would be like cats and use their boxes all the time for everything when in reality they can urinate in the litterbox and leave droppings everywhere they feel like in the cage. Last night we saw progress when she was out of her box, she hopped in for a second, used her litterbox, and then hopped back out. Yay!! You’re supposed to give lots of praise. Yay Jackson! !